We offer two models - the De-Luxe Light Visor and the Solarmax Visor. A special visor is now being used by astronauts in the International Space Station. which turns off the light when your treatment time is up. Up to 3,000 lux with 12 x white LED. 105g (7oz). 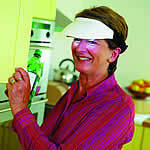 Solarmax Light Visor 60 minutes use per day. Up to 1,000 lux with 6 x white LED. 190g (7oz). Both use direct retinal illumination.